Who else has considered signing up to be the guinea pig on this whole head transplant thing? Y’all- I am one setback away from personally dialing up that doc and telling him I’m in. Ok…maybe not really but a new body sounds pretty nifty right about now- I mean, think about it…you could treat it like a new car-outlaying all the bells and whistles that you ever wanted. For me-I just want to have my pain decreased and to ride horses again. Today I visited a neurosurgeon to discuss a neurosheath tumor that is encapsulating my S3 nerve in my right hip. I’ve known about it for a month and have been through two MRIs. My doc told me that they are “fairly” certain it is benign so he thinks removal would be far too risky…sooo what am I suppose to do? Limp around the rest of my life? Give up horses for good? No doc…just no. This curveball is a little much considering I just had hip surgery in March (femural acetabular impingment). I was suppose to be nice and greased up for the next ten years and able to conquer the world! Curveballs are funny aren’t they? You never see them coming . For me they are always medical- at least for the last three years- but for you they might be something completely different. Well-I’m going to fight. I don’t feel like it but I’m going to. People say I’m strong but what they dont see is me wanting to just curl up in a ball and give up…so if that’s how you feel too…then join me. Link virtual arms with me and rise up and fight your battle. We will all survive . We will a make it through . I thoroughly believe God is letting this happen to me for a reason. I dont know why yet but I’m going to find out…eventually. As for Pappy, the donkey, he is my saving grace. He comes running up to me every time I go down to the pasture. He is gentle andand understanding. He wants to learn. 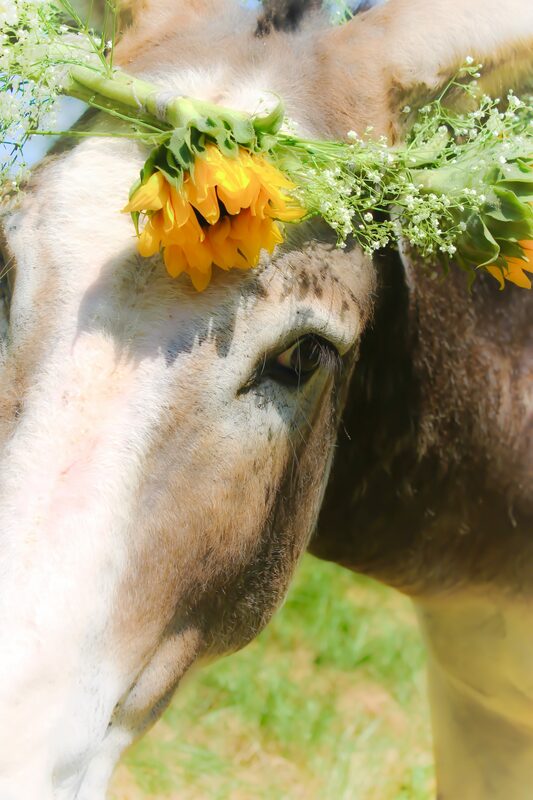 Maybe I’m meant to just be the crazy donkey lady and drive donkeys around town – that doesn’t sound awful to me! We will see where this curveball goes. One step at a time.